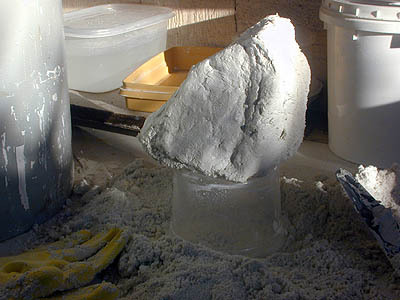 This is a hunk of slaked lime from the bottom of an unstirred bucket, lime kept under water for three months undisturbed. Notice how firm it is. It's been laid on paper towels to absorb all external water off the hunk. This is the hunk surrounded by unfired crushed limestone that has been sifted finely to make a fine white intonaco. This will be the Intonaco Pronto, which I'll pack up and carry with me. 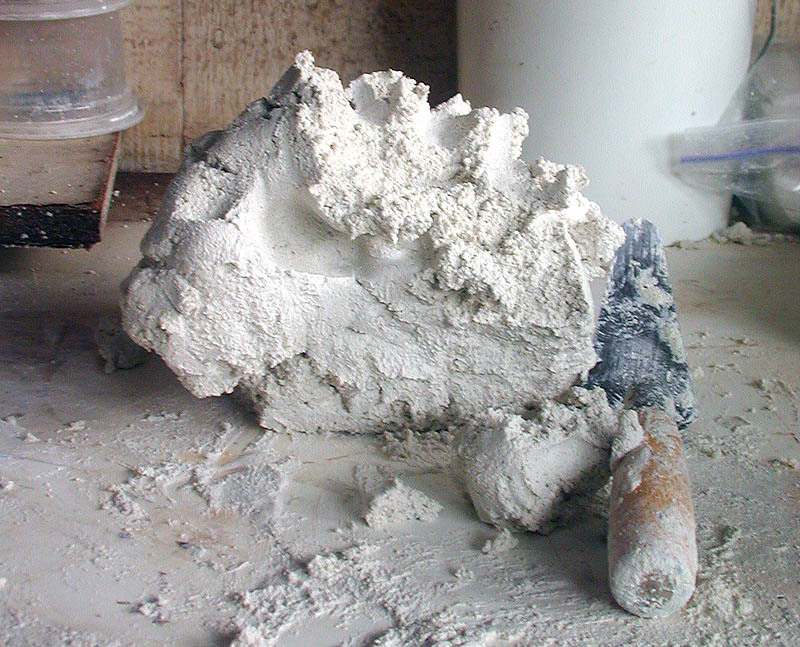 Here is the 1:1 lime and small sand intonaco mortar, very stiff, very unlikely to crack because of shrinking lime. It doesn't have to be applied this thick. Lime shrinks because of too much water content. The rubber gloves are what I used to hand mush the lime and limestone. Don't get it on your hands, if you do neutralize the lime with baking soda. If you get lime in your eyes wash them with milk and sugar. I made a test on cracking by laying an 1/8 inch intonaco on glass and on dry wood. Four hours later both cracked a lot. Intonaco needs a wet base to draw from. 4000 B.C. Egyptians had watercolors and lime paint made from tin element based colors, and made plaster by heating limestone for murals and gypsum for building, adding alum to lime made a hard cement. 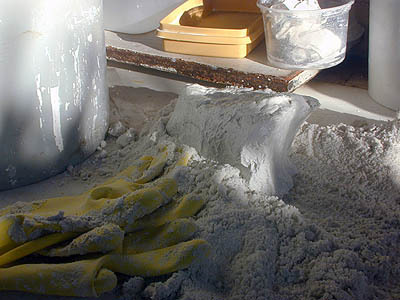 Limestone powder is chalk or calcium carbonate. Gypsum is Hydrated calcium sulfate, a light spar. When heated to remove the water content both gypsum and limestone will make a plaster of Paris. The limestone crystal the is softer of the two and it contains no sulfur to effect the color pigments. Gypsum makes the harder more waterproof cement but has pigment color changing sulfur in it so it's not used for murals. After slaking lime, remove all the slaked water off of the top. This is clear lime water. The longer you wait the harder the sediment lime compacts it's self, but it will never dry under water. Lime and water don't mix. Lime that has been heated or calcined and has had all the water removed from the compound it is very porous. When the grain of lime reaches it's total absorption capability the cell is very close to the weight of water and only the weight of the lime crystal will cause it to precipitate. The lime is heavy compared to the water molecule and it will sink, but slowly. Quicker as time goes on because the lime is contracting as it sinks and compresses with other lime. The lime crystal will dry in the water up to the point of squeezing 33% of the water out, it takes time. Stirred slaked lime can be from a thick yogurt after 4 months to like 70 degree F. butter after 24 months. that's called a buttery consistency. When using two month old lime, put the quantity to be used on paper to absorb all the excess water. It won't stick to the wet paper, lime prefers to stick to itself. Two to four month old slaked lime will not hold any more water and has cast out some water becoming heaver and sinking faster. Slaked lime sinks quickly. Out of the water it could shrink more and faster. Dried lime re-crushed sinks fastest but looses it's bonding power and it's alkalinity. At this point it makes a good white pigment. The lime we buy has been slaked once, dried and recrushed. 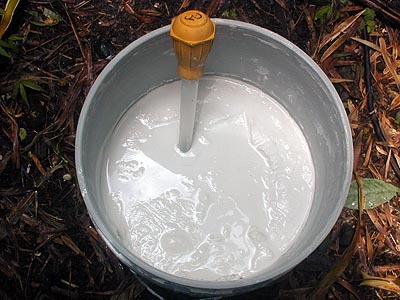 The first wetting makes quicklime and it very caustic. 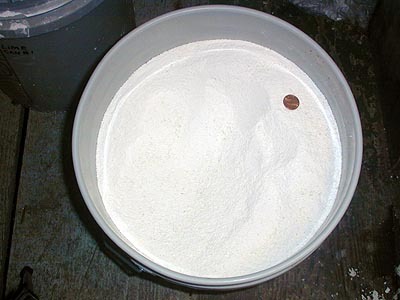 This is dry crushed unheated limestone in a bucket, a white jagged aggregate for making mortar. 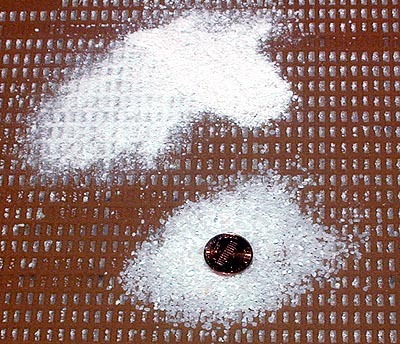 This compares a bag of crushed limestone, which is available at pool builder supply stores, where it's called called crushed marble. Here is how I sifted out the medium and large grains. As you can see there is a lot of unfired limestone in powder size, perfect for intonico. To slake lime, sift in as much lime to the water as it will hold. Add a third more water and stir it up. This photo of lime after 4 months of slaking. Soon I will stir it up with my hands in latex examination gloves and have a smooth buttery lime paste to make into mortar. Soak the tile, it should hold all the water it can with out a shine. It will give, not take from the mortar. Rub on the 1:2 mortar mix width large sand completely on the tile before spreading the mortar. Be sure the mortar is a sticky consistency. To make a fast mortar frame place two of the same size tiles on each side with a 9/16ths inch spacer under the tile being coated in mortar. Or raise the outer tiles, or cut boards to the right height. Short strokes back and forth will just peel the excess mortar off and leave a tile with exactly 1/8th inch of motrar, no more. Less is Ok.
Let the overhang set for a while before you scrape it off. This will give a better edge. 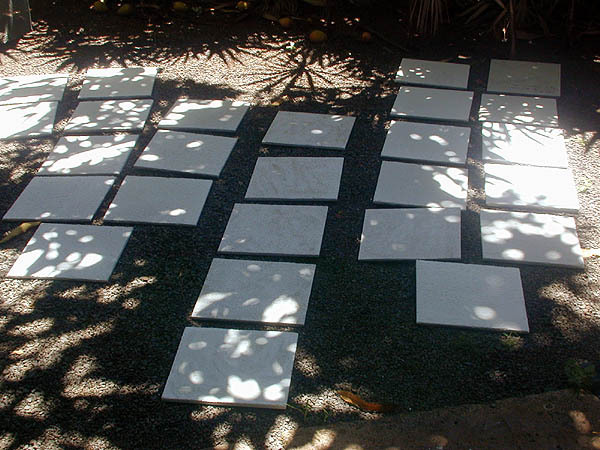 Here are 27 tiles drying for the Haleakala Waldorf School Project. This should be the last fresco test I have to do, 01-19-05. "What is the compared open time between white cement and lime mortar?" I made two 8.5 inch tiles. 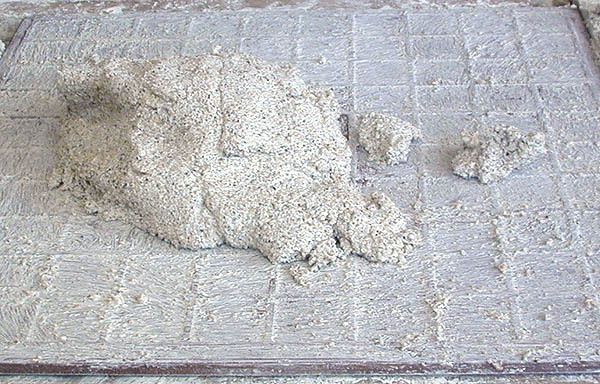 One with a white cement rough and one with a lime rough, both with 1:2 small sand. Two weeks later I put on the intonaco, 1:1. 3:22, both roughs were covered with smooth intonaco, 15 minutes later I gave them a final troweling and removed any cream from the top. 3:45, I painted on the division lines on both tiles with a #1 rigger, a very long haired round ferrule with a flat end. Notice the top line of the lime tile, it is lighter because lime mixed with the pigment even though I used a very soft wash brush. It's still worth while though because it gets the location points in early. Every hour I painted in a section, cadmium red, red oxide, gold ocher, burnt sienna and red oxide again. 6:00, the lime is still soft and the white cement is much harder. 8:00, a little carbonate crust was forming on the lime so from here out I will be wetting the mortar with lime water. 8:30, another wash of lime water and a pressure troweling of all the remaining sections. The white cement mortar is hard, will it still be absorbing pigment? It paints nicely. 9:00, both are absorbing more slowly. I give them another lime water wash.
10:22, I was a little late, because I was watching the Australian tennis tournament. The white cement was singing. 11:00, the last section to be painted. I repressed the sections with the trowel. The white cement was hard. I don't give the white cement mortar much of a chance to hold the pigment, but I won't know for sure for two days, when I wash down the frescos and remove any loose pigment that didn't absorb. I'll point out the changes after the tiles were washed. On the first line, the white cement stayed the same. On the lime tile, because it was painted while the lime was very wet, the lime moved and mixed with the pigment. The final effect was it dried lighter. One hour later, 5:00, the cement and lime both worked very well. Two hours later, the cement didn't hold the pigment where it was the densest. It flaked off the red oxide which is an excellent fresco color. Three hours later, the white cement failed. The lime was just getting started. Four hours later, both the red oxide and burnt sienna failed in the cement. The yellow ocher held it's ground on both tiles. Five hours later, 9:00, the cadmium red and yellow ocher were lighter on the cement. The lime still had no changes. Six hours later, some red oxide flaked off the cement, the lime is still going strong with no changes. Seven hours later, 11:00. The white cement continued to deteriorate, all colors were failing. The last color down was cadmium red, which I laid on three times letting the shine disappear before adding the next layer. It worked, but... Be cautious about adding any white cement to the lime intonaco. Use no more then 20 percent if you want to be safe. The answer to the question is.. One hour for white cement verses seven hours for lime. If the lime is well taken care of, i.e. keeping it moist with lime washes and pressure troweling the unpainted areas as time goes on. With correct moisture and re-pressing the lime I have gone 10 hours.